All baseball fans know that probability is a huge component of their favorite sport. Just as, when you roll a die, you know that a certain outcome has a one in six chance of showing up, in baseball, each batter has a certain probability of hitting the ball based on their skills. Analogously, physicists are aware of the probabilistic nature of the interactions between particles and want to measure these probabilities to understand how nature works. A particle in a beam moving toward a fixed target can be imagined as a baseball, thrown by a pitcher, heading to a batter. The particle will not “hit” (interact) with a certainty of 100 percent. Depending on both the particle and the target, that probability changes, and it may be very low. What do physicists do in that case? They simply throw a lot of identical particles at a specific target in order to collect a reasonable number of interactions to investigate. Studying how particles interact with different targets in a statistical way can unveil nature’s secrets. The particle known as the neutrino interacts very rarely with matter. It comes in three types, and while traveling, there is a probability they morph from one of their types into another. This process is known as neutrino oscillation, and it’s one of the most active research topics related to these curious particles today. Neutrino-nucleus interaction probabilities are a fundamental prerequisite for every neutrino oscillation experiment. In high-energy particle physics, such probability is expressed in terms of an area, called cross-section. In order to correctly interpret the outcome of neutrino oscillation experiments, researchers need precise neutrino cross-section measurements in the desired energy range. Neutrinos that interact with a nucleus produce other particles that scientists study to learn more about the neutrino responsible for the interaction. ArgoNeuT was a neutrino detector filled with 170 liters of liquid argon. It was designed to study neutrinos produced in a beam, but more specifically to exploit and fully understand what scientists now call liquid-argon technology, because it makes use of the liquid argon as the neutrino’s target. Using data collected over six months by this detector at Fermilab, ArgoNeuT researchers measured the probability for a neutrino to interact with a nucleus of argon to produce a particular result: one muon, exactly one charged pion and any number of nucleons (protons and neutrons). 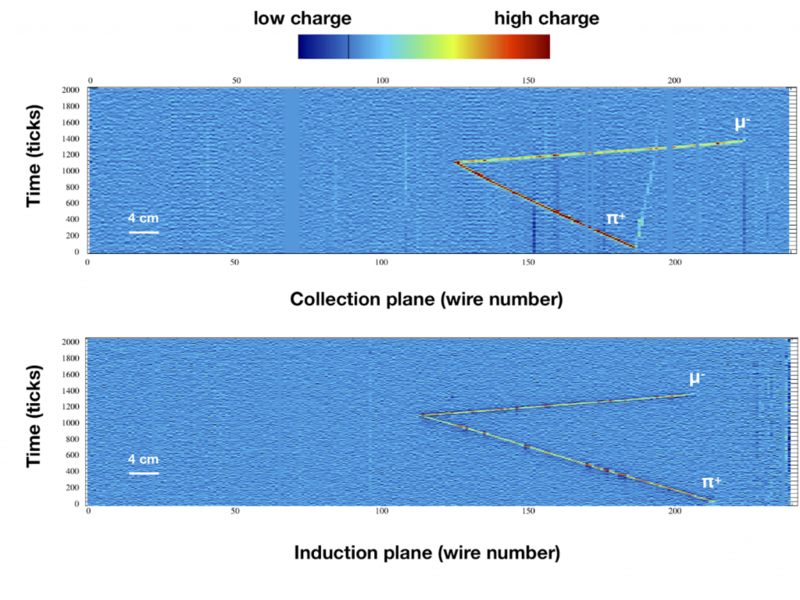 During the analysis of the ArgoNeuT data, scientists made fundamental improvements in the software that reconstructs the particles in the detector. These tools use the data to reconstruct – create a picture – and identify the particles produced in the interaction. 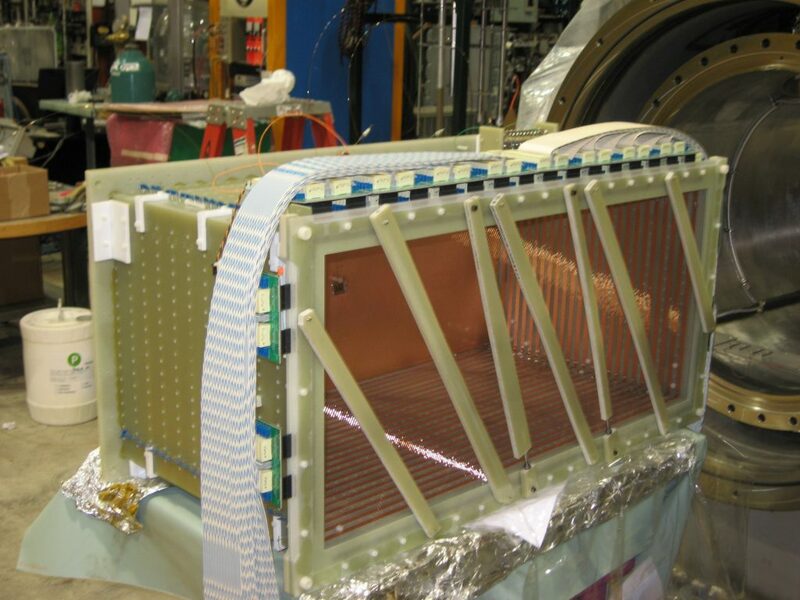 The same reconstruction tools will be used by current and future neutrino experiments that use liquid argon as the detection material, such as the MicroBooNE and SBND experiments at Fermilab. Moreover, these measurements provide new information about the neutrino single-pion production and can be used to improve the modeling of neutrino interactions with the argon nucleus. A negative muon and positive pion candidate event in ArgoNeuT. The figure shows the 2-D projections in the two wire planes. The color of the track respects the charge read by the wire planes, wire by wire. The ArgoNeuT experiment was the first ever to make cross-section measurements of neutrino and antineutrino (the neutrino’s antimatter counterpart) interactions resulting in a muon, a charged pion and any number of nucleons in the final state using argon as the target. Charged particles moving in the detector leave behind marks of their passage that can be read and recorded. Because of the structure of the detector, this information can be interpreted as a quantity of electric charge, proportional to the particle’s energy, divided into small dots along the particle’s path. In order to consider a particle “reconstructed,” all the dots must be grouped in a cluster, more or less like solving a connect-the-dots puzzle (without the help given by numbered labels arranged in ascending order!). Scientists can identify the types of particles that move through the detector based on their tracks. Researchers on ArgoNeuT managed to solve a series of issues. One was to account for the pesky presence of muons that happened to have no affiliation with any neutrino interaction in the detector. Such muons would arise from neutrino interactions with the environment surrounding the detector. They also took on the challenge of optimizing the reconstruction software for this analysis. The improved software was able to clusterize all the dots in the neutrino events in a more consistent and realistic way. Besides a chain of cuts able to remove the events that clearly didn’t respected the desired event structure, ArgoNeuT researchers implemented a boosted decision tree. This is a technique for creating a model that separates events according to several carefully chosen parameters given as inputs from the user. The boosted decision tree was trained using simulated signal and background samples, further improving the separation between signal and background data. After correcting for selection efficiency, scientists carried out the measurements and compared them with four of the most commonly used neutrino event simulators. The comparison showed a mismatch between data and most of the neutrino simulation predictions, showing how much physicists still have to understand about neutrino-argon and neutrino-nucleus interactions. The results obtained in these measurements can help improve the simulators taking into account more recent data from neutrino-argon interactions. Furthermore, because of the software’s great performance, ArgoNeuT will aid larger neutrino experiments in their quest to understand the nature of the subtle neutrino. Giacomo Scanavini is a Yale University physicist. Tingjun Yang is a Fermilab physicist.